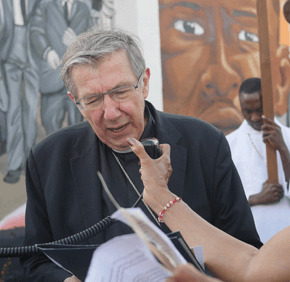 Baltimore Auxiliary Bishop Denis J. Madden leads prayer walks about once a month, but this one – the first since Freddie Gray Jr. suffered fatal injuries in police custody – took on special import. More than 100 walkers, including priests, religious, local Catholics and other people of faith, left from St. Gregory the Great, located at 1542 N. Gilmor St., and wound their way through the neighborhood in which Gray lived. They sang hymns and stopped to reflect and pray at points where lives were lost to violence, as well as the place of Gray’s arrest, near the intersection of Presbury and North Mount streets. Bishop Madden said a secondary tragedy of Gray’s death “would be if nothing substantive happened after it.” He noted that since Gray’s death, Archbishop William E. Lori has been working on plans for the Archdiocese of Baltimore to help tackle some of the systemic problems, including widespread unemployment, chronic truancy and addiction, faced by Sandtown-Winchester and similar neighborhoods. “We’re thinking about keeping buildings open after hours … as a kind of rec center,” Bishop Madden said. He also mentioned the possibility of West Baltimore locations for the Our Daily Bread Employment Center, a Catholic Charities of Baltimore service center that matches employees to employers. Bishop Madden said parishes could possibly offer “employment tutoring,” helping residents in need with resumes and job searches. He also mentioned the possibility of adult education in the area, focusing on skilled trades such as plumbing. “Those are respectable jobs, and those are jobs with which one could easily support a family,” he said. The deacon trudged through the late afternoon humidity, past active homes as well as boarded-up buildings. A few years ago, he had been part of a collaboration between police officers, residents and faith leaders, who had walked through troubled neighborhoods, “meeting with the young men on the corners,” trying to establish a dialogue. Deacon Barksdale said the initiative was “effective,” but nothing equivalent seemed to be in place at the moment. State Sen. Catherine Pugh, whose District 40 includes Sandtown-Winchester, stopped by St. Gregory and floated the idea of allowing graduates of Baltimore colleges and universities to pay $1 to move into vacant rowhomes for 10 years, while ex-offenders would be employed to rehab the homes. “It takes all of us working together to have a great city,” Pugh said. Participants in the walk said prayer would precipitate any positive structural change to come. No matter how long it takes, Deacon Barksdale added.